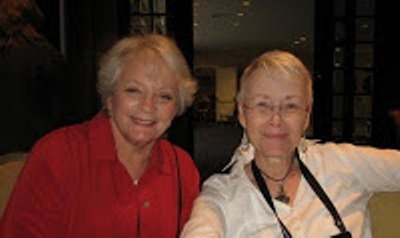 When I happily agreed to write a November 4th guest blog for Kaye, I had no idea that Gillian Roberts would be nowhere in sight, the way alter-egos and figments often are, and Judy Greber would be: boarding with a hitherto unknown 85 year old woman in Florida, three thousand miles from home, working (volunteering) a minimum of 12 hours a day, seven days a week for the past ten weeks and singularly obsessed with Barack Obama’s re-election. November 4th means only: two more days to get out the vote. No time for either meandering or musing. Instead, I happily turn the tables and spotlight onto our hostess, and here is(almost) everything you (or at least I) ever wanted to know about Kaye! Enjoy—and don’t forget to vote! What prompted you to begin a blog? When did it start? My memory is pathetic! Pathetic memory? Oh, gee – let’s don’t even talk about it. I had to go to Meanderings and Muses and look up these dates – even the year had escaped me. What prompted me to begin Meanderings and Muses was first being invited by The Stiletto Gang to do a guest blog about how I had recently quit smoking. This was in September, 2008 (I had quit smoking in May). I took to writing these types of pieces like a duck to water. It was fun! Next thing that was getting ready to happen was that I was going to Bouchercon in Baltimore and it was my first mystery con. I knew I’d want to write about it – and I knew I’d be taking lots of pictures. What better place to share my B’Con experiences than at my very own blog. (This after having been pretty outspoken about not really understanding the whole blog thing for a period of time. One example of Kaye Barley eating her words). So, I started Meanderings and Muses almost as soon as I got home from Baltimore in October 2008. It turned out to be a very extensive piece, and honestly – no other format would have been available or appropriate. Where else could I have written this sort of piece with all those pictures to go with the story? I decided right then blogging rocked. There was one small problem. I had NO idea what I was doing technically. Blogger made it very easy – up to a point. Then it all became complete gibberish to me, but, as in most things, with time came knowledge. In the meantime, flying by the seat of my pants does usually get me where I’m going. What was the original ‘shape’ you envisioned? Did you have an overall plan for Meanderings and Muses or did you think you’d let it grow organically—or what? Like practically every other thing in my life, there was no plan. Envisioning isn’t something I’m good at, apparently. With very mixed results, I’ve always been a, “I think I’ll give that a try,” sort of person. That’s not to say it’s something I recommend. In the case of M&M, I now had a blog, and I had now written about my first Bouchercon. Which was magical, by the way – and where I met you. So, now what? What do I talk about? Will anyone read it – does anyone care what I have to say? Do I have any ideas or topics in mind that might interest and engage others? All the same niggles I had about blogs in the first place now reared their ugly heads and stared me down. So, I just started writing. Anything that crossed my mind might find its way to Meanderings and Muses, and after a while, it didn’t really matter if anyone read it or not simply because I was enjoying the process. Blogging seemed to have been invented with me, and people like me, in mind. I wrote about many subjects I’m still writing about today because they have particular meaning to me, ie, how so many people confuse being an introvert with being shy, the importance of girlfriends and connections, and being a small town girl. I wrote about President Obama’s inauguration and about Aretha’s hat (which I thought was wonderful!). And books, of course. And authors. And I did some give-aways. And I did a “Best of 2008 Books and Authors List.” The “Best of List” is one I have continued each year and can’t imagine not doing. And somewhere along the line I had the bright idea of inviting guests. That’s when Meanderings and Muses hit its stride and, I think, found its own unique spot in the world of blogging and in the mystery community. What’s the best thing about writing/managing the blog? The best thing is the guests. Wow. I was so blissfully ignorant. Would I, today, ask some of the writers I invited back then to commit to doing a guest blog? Pfft. No. As it happens, I just did it. And, out of kindness, or just because they were taken completely by surprise, who knows, but every single person I invited (except two) said yes. I now have some of the best known names in the mystery world as annual guests – most of whom have been with me since the beginning. Some of these people were already friends, some of them have become friends because of M&M. Each has helped mold M&M into what it is today and I’ll be forever grateful. I’m proud beyond words of the guest list I have every year. And not just the well-known and mid-list authors. It’s been a lot of fun for me to discover new writers – and even more fun to introduce them to others. And then there's one of my favorite aspects of M&M - the writers who haven’t been published yet. They’re a very big part of the Meanderings and Muses community. I expect to see more than one or two of them in print some day. I sometimes have to nudge the readers who participate as guests to write a little something each year. They have important things to say, but some of them worry about how to say it. As it turns out, they’ve written a lot of the pieces that receive the most hits. I love Meanderings and Muses. It’s a big part of my life and of my heart. At first, and up until this year, the worst thing was doing it over dial-up. No one would believe how many pieces I thought I was finished only to have them hang up and then disappear. This was sometimes a major problem when guests would send their pieces later than I had requested – and/or used a lot of fancy formatting I’d have to strip out before posting. There’s been a lot of midnight oil burned doing guest spots. The surprises have been few, really, but some rather astounding at times. Some of the posts, on my part, get a little personal – to be expected because it’s my blog. I have occasionally been surprised by the personal and quite poignant pieces by the guests. There are a few that have brought tears. Some because of their beauty – some because they have broken our hearts. I’m touched that people have chosen Meanderings and Muses to share some of these stories. Surprises on a more personal level include two pieces starting their lives as blog posts and growing into pieces juried and accepted in two separate anthologies. I am over the moon proud of both those anthologies and being a part of the huge talent involved. To me, your exuberant personality is the essence of this blog, but how much of yourself do you feel you actually share—or think you should share—with your readers? Is there a “Kaye Barley, blogger” vs. Kaye Barley wife, writer, retiree, dog-lover, beach-lover…etc., etc. I am pretty much a “what you see, is what you get” person. And I’m very open about a lot of things. I have an opinion on just about everything and I’m going to share it. What better place than at my own blog? There’s no one out there who has read Meanderings and Muses who has a doubt in their mind about which political party I favor, or how much I detest mean people. Bullies, I’m sure, have their own circle of hell awaiting them and that makes me happy. I’m not one of those people who uses the internet to be any different than I am in person. If someone has stepped on my toes, I’m going to say so – either face to face or in writing. But rest assured – where or how I tell you how I feel is never going to change the fact that I am going to tell you how I feel. I’m not scared of much, and speaking my mind has never frightened me. This sometimes leads people to believe I’m going to share my whole life. But, no – I’m not. Not even close. And I try to be very careful that what I do share is actually mine to share. Not my Donald’s, not my mother’s, not close friends’. Their stories are not mine just because I happen to know them. I have to remember that and walk a fine line. Some questions for Kaye Barley, reader extraordinaire and in addition, writer of long fiction: First, now that you’ve written a novel (hooray!) do you read other people’s work differently or with different expectations? I do think I start a new book by reading differently. I find myself looking at things, studying them and learning from them – but then the longer I read a particular book – if it’s one I’m enjoying - that falls away and I’m then just reading as I always did, savoring the beauty and cadence of the words, the phrases that touch me and the story. I find myself falling in love with the characters and the setting. And I’m glad. I don’t want to find myself critiquing and deconstructing everything I read. I want to read purely for enjoyment and escape and my love of words and story. I hope I’ll always be able to do that. Actually – you had a good bit to do with it. You and Earl Staggs – who both told me early on that you thought I had a distinct voice that could work well for me if I ever decided to try my hand at fiction. Those conversations ebbed and flowed for a long time, but my interest, then, wasn’t in writing fiction. I didn’t think it ever would, really. (Example #2 of Kaye Barley eating her words). I was happy as I could ever imagine writing the sort of pieces I was writing. It thrilled me when I learned that they even had a name – “Creative Non-Fiction.” Cool! I was over the moon when I submitted my first piece which was accepted for publication in the anthology “Clothes Lines.” And just as proud to be accepted for a second – “Women’s Spaces Women’s Places.” During a group get-together Celia Miles, the editor of both anthologies, had for the writers she told me something I will never ever forget. She said, “I hope you’ll continue writing, you were born to write.” I was stunned to hear the words and overcome emotionally. And I will never ever forget the feeling. That coming from a woman I admire as much as I do Celia is something to be cherished – as is she. And I wasn’t filling my days as productively as I would have liked. This after having made myself one promise when I retired – to spread my wings. I would now have the time to explore creative outlets I had not had the time to explore while working. And so, I started writing a novel. I remembered reading the quote about writing the book you want to read, and decided that’s what I would do. It was a secret for a very long time. You knew and Earl knew. And Donald knew. That was it. You, being you – were supportive and helpful in all ways. Your personalized copy of YOU CAN WRITE A MYSTERY is always close by – along with Anne Lamott’s BIRD BY BIRD, and Stephen King’s ON WRITING. Earl, on the other hand – has stood next to me with a whip! Actually, he has held my hand and patiently walked me through the process from day one until almost two years later we said, “The End” together. I lost track of how many drafts we did. Each time I thought I was finished he’d say, “no, not yet.” And I’d find myself working on yet another draft. And, loathe as I often was to admit it, each one was better than the last. Now, the manuscript is out to a few “First Readers.” Once it comes back I’ll have some decisions to make. More re-writes, or not. We’ll see. Any wisdom or warnings you’d want to impart to somebody beginning their first novel? DO IT! And don’t wait for “the right time.” Just do it. A year is going to pass whether you’re writing or not. Do you want to look back and wish you had started that book? Just do it. And, you know what – do it for “YOU.” Forget about all the other stuff – the publishing end, the querying, the critiques – just write it for yourself. No one will ever be able to take that accomplishment away from you. No one. What was your work routine while writing Whimsey? I wrote almost every day. At first, my routine consisted of getting up with Donald and as he was going to work, I would go to the gym, run errands, come home and write. Sometimes for a few hours, sometimes well into the night – that just depended on whether the characters were feeling particularly playful and creative that day or not. After a while the routine changed. I would send pages to Earl and then I’d be so excited when they came back I’d start working on them. It didn’t matter if I saw his email at 11:00 at night or 6:00 in the morning, or what had been on the schedule for that day. The writing pretty much took over. After that, there was no routine, really. Except that I would still write almost every single day. Any surprises along the way? Had you plotted it out beforehand? Did that plot work? Oh, you’ve made me laugh. Surprises? More than I’ll live long enough to tell. And some I shouldn’t. The first surprise was how much I didn’t know, and admittedly, a lot of which I still don’t. Luckily, I had an angel by the name of Earl. If I had had even a clue as to what I didn’t know about writing, it’s doubtful I would have started. Earl Staggs made most of the doubts disappear and had me forging forward. Not many people writing their first novel will be lucky enough to have a one-on-one writing class like I did. Earl Staggs is a terrific writer. He’s also a great teacher. He’s an editor beyond the pale. He’s not one to let you slide and when I wanted to just quit, he had a sly way of keeping me in the game. The next surprise was how hard it was. And a very good friend said to me, “the only people who don’t think it’s hard are those people who haven’t done it.” True, that. A really big surprise came when I finally finished the manuscript to the point that I felt like it was ready to be seen. I was surprised, honestly, that finding the guts to let it go and be seen was harder than writing it. That was the sound of my heart hitting the floor before it shattered into a million pieces. But – there were valid points made and I paid attention and rewrote some of those first 10 pages. But then I was scared to death to let anyone else see it. Well – of course, she was right. I then sent the first two chapters to four writer friends. Each replied with something kind in the subject line of the email (something everyone should remember to do if asked to do a critique, in my humble opinion – it made a world of difference to that “thing" - that huge lump that had taken up residence in my stomach). Each started off with an encouraging word and then proceeded to make comments on what they had read. The surprise here is that each person had totally different takes on the same two chapters. Something that bothered one, got applause from another, etc. Interesting and an exercise I learned from. Had I plotted it beforehand? No. Honey, I didn’t know plots from popcorn. I had a basic premise and that really didn’t waver. Characters pushed their way in (some I pushed back out), and a story line I wanted from the very beginning changed in a major way, then disappeared completely. And then Earl let me know (in his inimitable gentle manner) that I didn’t have a plot at all. Just a bunch of really nice characters with no conflict and it was just boring as hell. Pffftt! So now there’s a plot. There are still some really nice characters, but there is conflict. And there’s magic. Some folks may not like it – but I’m proud of it, and hey – I like it. And really, I’m the person I was writing it for. I wrote a novel I wanted to read which is just what I started out to do. If it brings others some enjoyment, that’s the cherry on top. Good question! I wish I knew!!!! Right now I’m still waiting to hear back from first readers, including another writer friend. Depending on what the readers say, and how many agree on what they think individually. That’s going to help determine whether or not I think I still have more work to do or if I’m ready to start the agent query process (which scares me to death). If the agent queries turn up nothing, I’m thinking about what I might do, but no decisions yet. I’ll be 64 years old this month, so truthfully? I’m not sure I want to give as much time to the querying, the heartbreak of rejections and all that, as some people would. I’m going to try the traditional route – but I don’t think I’m willing to give it years of trying. An eBook is not something that puts me off and while I’m querying I’m planning on looking into this as well. In the meantime, I’m making notes for Book #2. It’s not a series, but I’d like to do a book about each of my main characters – five lifelong women friends who are artists and have returned home to the Island of Whimsey to pursue their art. And a wicked pixie named Earlene who favors tight fitting designer clothes and Louboutin stilettos and a cigar smoking matriarchal ghost who drops in from time to time to make sure things are going as planned. Was it hard writing both the blog and a novel at the same time? It’s been hard. Mostly because if I was writing for Meanderings and Muses I felt guilty and felt like if I was writing I should be writing for Whimsey (the working title of my novel). In the midst of all this, I received an invitation from the elegant, delightful and OH so talented Hank Phillippi Ryan to join the Jungle Red Writers at their blog as “Oh, Kaye!” - a monthly contributor. I was so thrilled, I put aside my guilt. You kidding – Jungle Red! Wow! Forget guilt! So, some of what I would maybe have written for Meanderings and Muses has instead gone to Jungle Red, which I’m honored to be a part of. This allowed me to pursue another love that I could use Meanderings and Muses for - photography. Donald and I both have been interested photography for a very long time - sharing some of our work at M&M has become an almost daily exercise, and one we both enjoy. We're part of an incredible group of people doing a photo a day challenge. Spreading my wings is turning out to be a fabulous thing to do - I hope I remember to keep doing it and not relax into a position of just existing without creative challenges. The writing end of Meanderings and Muses is being kept afloat for the most part by my weekly guests. They’re getting as many hits as ever, so my not being there much hasn’t made a bit of difference in M&M’s audience. Oddly enough, even though there are usually a few hundred hits per day, there are not a lot of commenters. This used to worry me, now I don’t really give it much thought other than I worry that the guests might feel ignored or slighted. But what I’ve been told by many of the writers is that they see a surge in their amazon numbers after they’ve visited. And that’s a great thing! If someone discovers a new writer, or picks up a book because of Meanderings and Muses I have done a good thing and I’m happy. What’s ahead for Meanderings and Muses? I don’t know. It’s never going to go away – but it will change. And change is good. It has, truthfully, changed a little every year. Some of the guest writers are now writing about things other than their books. One year we featured people’s work spaces - one year we featured some of their pets. This year we’ve had more “chats” featuring two or three people at a time having a conversation. This year I posted a lot of poetry during the month of April because it’s National Poetry Month. This did not eliminate our mystery writers because some are also poets. Reed Farrel Coleman is a wonderful poet and I was happy to post some of his work. While some of our mystery writers were shy about sharing their work, they did share privately, and some suggested poets to me they thought I might enjoy. Next year, however, will be different from the others in that I don’t have a schedule of guest bloggers. I intend to have guests – but not as many, and perhaps just randomly. I’m still sorting through all that. I don’t feel like, right now, I have the time to dedicate to Meanderings and Muses at a level that I once did. At least, not while I'm working on all the many aspects of writing and rewriting Whimsey and all the things that follow, but that could change in a minute. I like knowing that if I wake up in the middle of the night with something on my mind I have this wonderful spot that’s all mine where I can write and sort through it all. That’s become a very important fact of my life. It will always, though, always be a place with the mystery community at its heart. We’ll just see where it all goes . . . .
What question do you wish I’d have asked you instead of/in addition to these? Jude, I don’t think you missed a thing! And it’s been a bunch of fun. Before we say "The End," I want to thank you for all the support you've given me. And for always being there to answer a question, or let me bat around a few ideas. Mostly though, I want to thank you for what you're doing in Florida. You've always been an inspiration, but making this big move to temporarily leave your beloved home and much adored family to work on a cause you believe in so deeply is worthy of "Hero Status." Hugs, my friend. You are the best. Nice to see the tables turned and Kaye answering the questions! Good job to the both of you -- and I can't wait to read your novel! This was wonderful, Kaye! What cameras do you use Kaye (if you don't mind saying)? I always adore your photography. And many thanks to Judy Greber for her campaign efforts too! Hi, everyone - Thanks for stopping by! Patty, Thank you! Somehow, someway, that book is going to get out there. Keep your fingers crossed, okay? Lil, one of these days I may have to learn to quit speaking my mind so much. What do you think the chances are of that happening?? LOL!!! Thelma - I've been thinking about you - everything okay in your neighborhood??? Brenda, Thank you! and Judy is something, isn't she?! she is one very inspirational woman. I'm glad you're enjoying the photographs - we're having a lot of fun with them. We're fans of Canon. My camera is a G12, Donald's is a PowerShot SD1000, which is a phenomenal little camera and I highly recommend it. Oh, Kaye Darlin’, this was a delight to read. Whoop! Whoop! Whoop! to you and Judy. Thank you for letting me be a small part of the development of Whimsey. As someone else said, you were born to write. It was only a matter of time before that natural talent worked itself to the forefront of all you do. And all you do is special. Like making everyone who knows you feel better about themselves and the world around them. And be happier just for knowing you. I certainly am.